Since 1900, the youngest serving state leader has been 192-day-old Fuad II, King of Egypt (left), while the oldest has been 96-year-old Hastings Banda, President of Malawi (right). This article contains various lists of state leaders organized by age, defined as heads of state and/or heads of government. People currently serving as head of state and/or head of government, or a representative of a head of state. The following lists are the top ten all-time state leaders and the top ten living. Leaders still serving are highlighted in italicized bold. 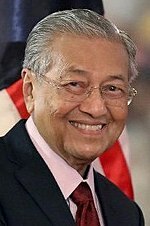 ^ Previously served as Prime Minister of Malaysia from 1981–2003. ^ Previously served as Prime Minister of Tunisia in 2011. ^ Previously served as Prime Minister of Cameroon from 1975–1982. ^ Previously served as President of the Council of Ministers of Lebanon from 1988–1990. ^ Born in 1107, date unknown; died on June 1, 1205. 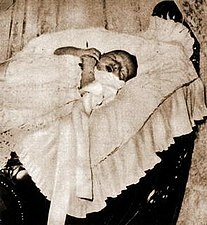 ^ The dates of birth and death for Ek are unknown. This page was last edited on 23 April 2019, at 08:18 (UTC).